The concierge service at Guest Apartment Services Paris is pleased to introduce you the famous big department store Galeries Lafayette. Galeries Lafayette Haussmann is a Paris department store located on boulevard Haussmann in the 9th arrondissement. During 2009, Galeries Lafayette received approximately 25 million visitors on a sales area of 70,000 m2. As a fashion specialist located in the heart of cities, the Galeries Lafayette group is developing, in France and around the world, as a reference in omnichannel trade and is helping to promote a certain French Art de Vivre through its brands. With its architectural heritage and a strong culture of innovation, the Galeries Lafayette group welcomes more than one million visitors every day in 280 stores and e-commerce sites. The Group maintains a historical and emotional relationship with its customers that continues to live on all its meeting points, physical or digital, to offer the best of commerce and creation. A leading private employer in France with 16,000 employees, the Galeries Lafayette group bases its identity on founding values: the passion of the customer, the audacity to innovate, collective commitment and a taste for excellence. 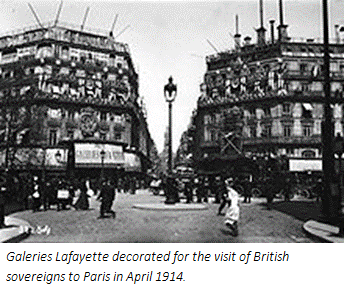 1893 Théophile Bader and Alphonse Kahn joined forces to create the lafayette galleries, a high-end store. 1894 Opening of the "Les Galeries Lafayette" store at the corner of rue La Fayette and rue de la Chaussée-d'Antin, more than forty years after Le Bon Marché. The store is ideally located near the Opéra Garnier, the main boulevards and Saint-Lazare station. Very quickly, it attracted office workers and the small and medium-sized bourgeoisie. 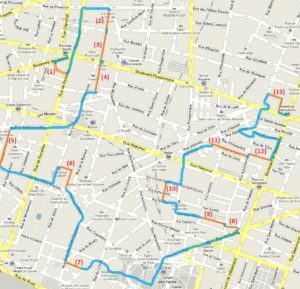 In 1896, the company bought the entire building at 1 rue La Fayette and, in 1903, the buildings at 38, 40 and 42 boulevard Haussmann and 15 rue de la Chaussée d'Antin. The first years of the company were mobilized by this "stone strategy", which led to the creation of a large real estate perimeter, unified by an architecture adapted to the needs of the business. Georges Chedanne and then Ferdinand Chanut were in charge of the design of these new acquisitions. On October 8, 1912, the huge Art Nouveau dome3 was inaugurated: its circular architecture, its highest point is located 43 metres above the ground, this glass dome is crowned by ten concrete pillars (Théophile Bader liked to use very modern materials for the time, as well as reinforced cement on the floors. The decorations are made by masters of the Nancy school. 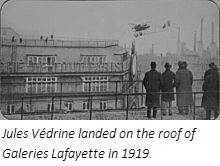 In 1900, the brand Aux Galeries Lafayette was registered. 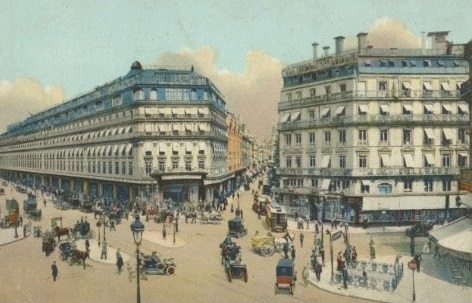 In 1908, the first store on Haussmann Boulevard opened. The new store was inaugurated in 1912 and consisted of 96 departments, a tea room, a library and a hair salon. It has five floors, balconies and a large dome. This one, inspired by the Byzantine style, 33 metres high, consists of ten bundles of painted stained glass windows, enclosed in a metallic frame richly carved with floral motifs. The balusters on the lower floors, decorated with foliage, are designed by Louis Majorelle, to whom we also owe the staircase. According to Théophile Bader's wishes, a golden light, coming from the dome, floods the main hall, with its main staircase, and makes the merchandise sparkle. At the top of the building, a terrace allows you to discover Paris and its new Eiffel Tower. The windows play a major role in this production: they must awaken all desires and desires. Everything is done to make the customer feel good and want to buy. The store specializes in novelty and fashion. The democratization of fashion is underway and success is on the way. Then the store diversified its offer: to the traditional departments were added men's clothing, furniture, toys and tableware. Paris 1916: Galeries Lafayette is already 27 years old. The concept of a luxury bazaar created by its founders Théophile Bader and Alphonse Kahn was a hit in Paris. The two cousins decided to export the concept internationally. After the Great Depression that followed the 1929 crisis and the Second World War, the 1950s saw a recovery. Many commercial operations appeared, such as the arrival of Edith Piaf, who agreed to come and sing in 1950 when she was the favourite star of the French. In 1953, Galeries Lafayette inaugurated a new concept of commerce by launching the first of a long series of exhibitions. In 1958, the "3Js" were launched, topical and high-quality items offered for sale at exceptionally low prices for three days. In 1969, a new store, reserved for men's fashion, was built across the street from Mogador. Galeries Lafayette is an important player in the creative process and reveals new talent every season by making small boutiques available in the store. 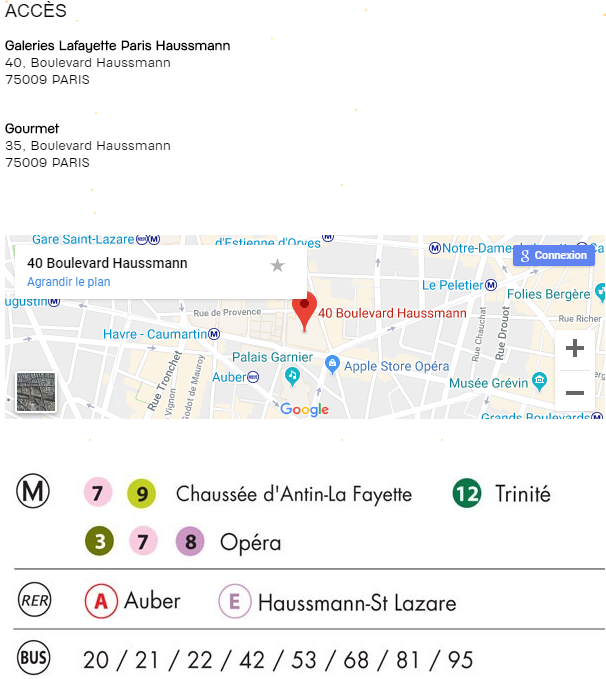 Since 1975, Galeries Lafayette Haussmann, with its 47,800 m2 of sales area, has been France's leading company, with a turnover higher than that of Printemps, BHV Rivoli, Samaritaine and Bon Marché. In 1980, the store further affirmed its vocation for fashion by creating the highly successful Fashion Festival. In 2009, a sales area dedicated to women's shoes was opened in the first basement, covering an area of 3,000 m2. This makes it the second largest shoe store in the world, behind Selfridges in London. In 2010, opens a Bordeauxthèque, the largest Bordeaux wine cellar in the world. Christmas enjoying by galeries Lafayette: Illuminations covering all the facades of Galeries Lafayette, filled windows and a gigantic fir tree, this is what you can discover at Galeries Lafayette. As every year, the department store lights up as Christmas approaches, to the delight of both children and parents. The little ones will marvel at these beautifully decorated windows. In addition to the costumes, there are also the sets. It is of course to music that these decorations will be activated before your eyes. During your walk, you will surely come across fake models, also dressed by the great fashion designers. On the fir tree side, it is located inside the department store, under the Haussmann dome. The Christmas tree is very impressive since it reaches a height of 20 meters. You have to look up very high to see the end of it. Finally, to ensure that the magic works to the maximum, the tree is decorated with the Christmas colours each year with a new original theme. Finally, you will discover the illuminations on the Haussmann facade. Lights that we see from afar, that we appreciate up close and that immediately plunge us into the world of Christmas. Cinema : In the film « Fear over the City » with Jean-Paul Belmondo, a memorable chase scene takes place on the rooftops and inside the store. While shots are being fired, a leitmotiv-shaped sound message is heard: « There is always something going on at Galeries Lafayette ». The concierge service at Guest Apartment Services Paris is always pleased to recommend our guests, expert tips for the best shopping at Galeries Lafayette. The Arab World Institute is an organization founded in Paris in 1980 by 19 Arab countries with France to researche ans disseminate information about the Arab world and its cultural and spiritual values. The Institute was established as a result of a perceived lack of representation in the Arab world in France, and seeks to provide a secular location for the promotion of Arab civilization, art and knowledge. 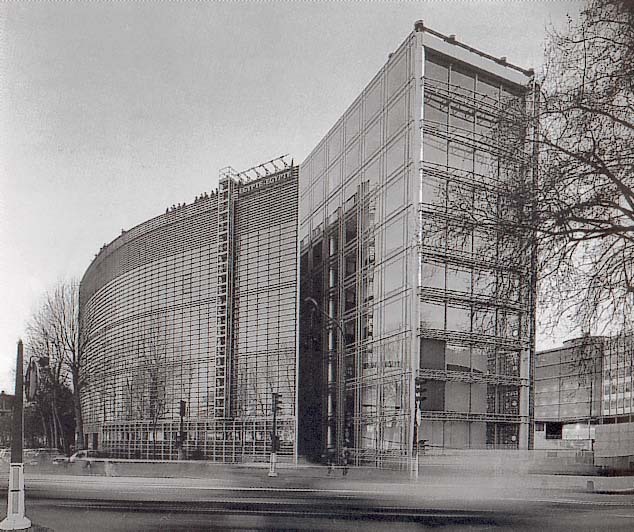 The Arab World Institute is located in a building known as the “Institut du Monde Arabe”, in the 5th arrondissement of Paris. Originally, the project was conceived in 1973 by President Valéry Giscard d'Estaing. as part of his urban development series entitled, the "Grand Projets." The Institute promotes cooperation and exchanges between France and the Arab nations, particularly in the areas of science and technology, contributing to the understanding between the Arab world and Europe. In February, 2012, The Arab World Institute revealed its new spaces, after three years of works. bronzes, ceramic, woodwork, textiles, scientific objects, illuminations and great exhibitions are regularly organized. you can admire contemporary works of art which represent the actual world. The Arab World Institute organized each year temporary exhibition that shows the Arab world wealth and diversity of creation. and the other shows the contemporary Arabs world like “Hip Hop, du Bronx aux rues arabes” or “Maroc contemporain”. with “Il était une fois l'Orient Express” are presented. a spiral which makes discovering in a long panoramic view the city shape, the Seine, Notre Dame, and the boulevard Saint-Germain. This “Tower of books” ramp reminds the famous minaret of the Samarra mosque. This space reminds, by its hugeness, the Luxor temple and especially the Córdoba mosque, an emblem of the Arab-Muslim world architecture. (like a piece of Palmyra tombstone). with all its monuments and in the first plan, the Cathedral Notre Dame de Paris. During your teatime or in the evening with a cocktail, just come and try the experience to see a beautiful sunset. The covered passages of the City of Light. Built in the 19th century, these passages were the precursors to the modern shopping mall. Their interest decreased with the development of “les grands magasins” at the turn of the century. Discover these superb covered galleries, especially during the winter time when it drizzles … sit at a café, enjoy old books stores and toys stores, what else ? 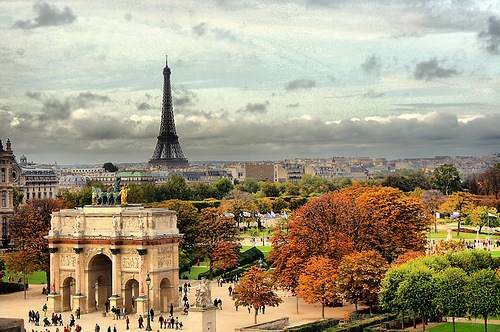 Fall & Winter Seasons in paris ! A period of 5 weeks dedicated to shopping! 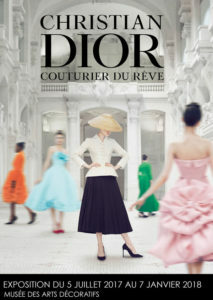 The Paris fashion sales offer a shopper’s paradise! They commence on January 10th & finish on February 20th 2018. 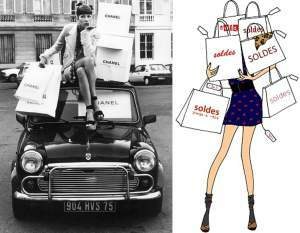 To all our "Parisiennes" from the world wide, Let's go to Galeries Lafayette’s Haussmann fashion store in Paris! This iconic Paris monument is a symbol of Art Nouveau architecture! 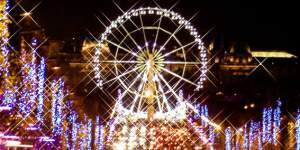 Paris literally sparkles more than ever in Winter Holidays Season! 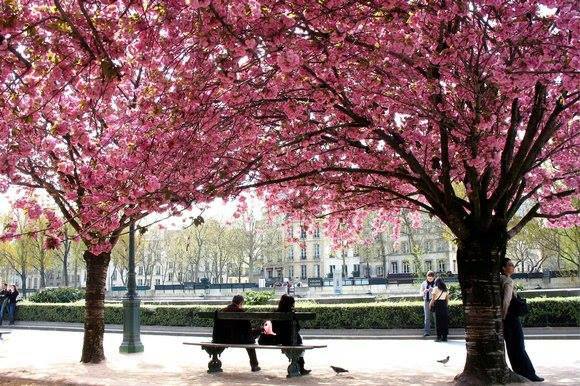 Paris may be ideal for you ! Check out our Paris Fall & Winter Special Offer. 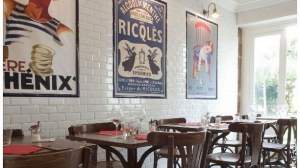 "The Metropolitain”, an Exquisite Gourmet destination ! The setting is a reminder of ancient metro stations featuring ceramics, benches, wooden chairs and even a station clock, and walls adorned with antique Parisian posters. Chef Paul-Arthur Berlan worked at Le Meurice (3 Star Michelin) with Yannick Alleno for four years. 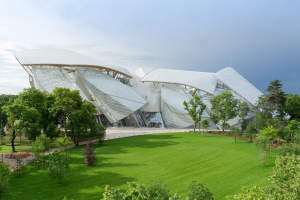 Discover the extraordinary ‘spaceship’ designed by its architect Frank Gehry, in the Bois de Boulogne, West of Paris. A new contemporary structure seen as "a timeless work"… It is the opportunity to revisit an extraordinary architectural adventure, through an exhibition dedicated to the building. For the ultimate experience of romance we invite you to come to Paris in February for Valentine’s Day. Lot of couples came to celebrate Valentine's week-end in Paris! Our conciergerie team has been glad to recommend the best places to enjoy this special event! 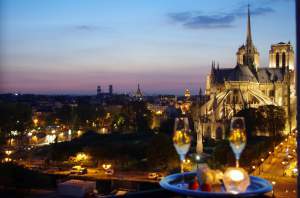 An Exceptionnal Property fo holiday rental with Exclusive and Incredible Views of Notre Dame… Paris at your feet ! Garance, a Paris Luxury Contemporary Two bedroom Apartment on Ile Saint Louis. Exclusive & Incredible Views of Notre Dame, at your feet… Book this property online for your next vacation stay ! Liliane, Christophe, Philippe, Marie & Margaux will be pleased to welcome you on Ile Saint Louis. Meet our Paris team in the Welcoming Office on Ile Saint Louis! & assisting you with our full range of Concierge Services… Discover our Paris Welcoming Office. The “Garde Républicaine” (French Republican guard) is part of the French police. There are responsible for the entire security of the Head of States during their official visits in Paris area. They are considered as Honor guards of Elyssées. They symbolize the Prestige of our French Republic. 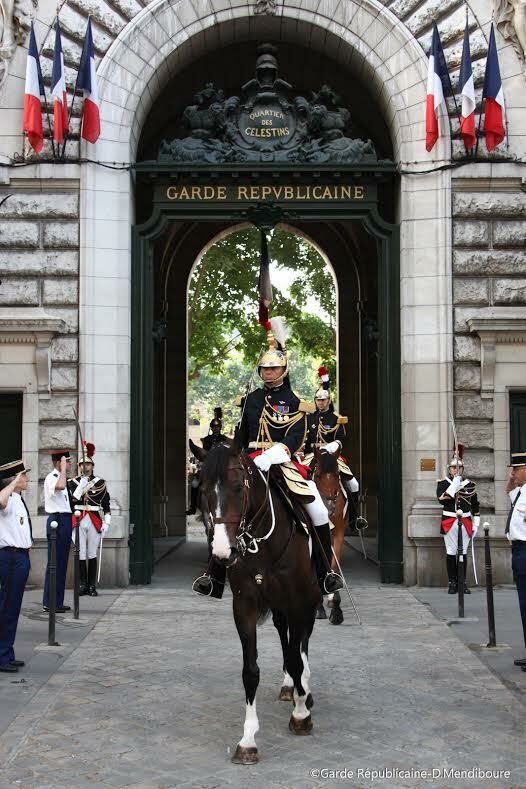 The “Garde Républicaine”, commanded by a Major general, includes two infantry regiments, a cavalry regiment, a staff and musical groups like orchestra and choir of the French army. Located in the “Celestins” area, this district houses the headquarters and the cavalry regiment of the French Republican Guard. It is the training area of the cavalrymen of the French Republican Guard. Its stables lodge the 140 horses of the 1st squadron to the brass band of the Republican Guard. Constructed in 1895, One can admire the magnificent Eiffel Tower style structure of the riding stables where the cavalrymen train daily. 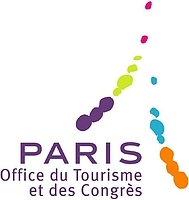 Our Concierge service team recommends you to visit this interesting museum which is within walking distance from your future Paris apartment between Ile Saint Louis and Bastille. 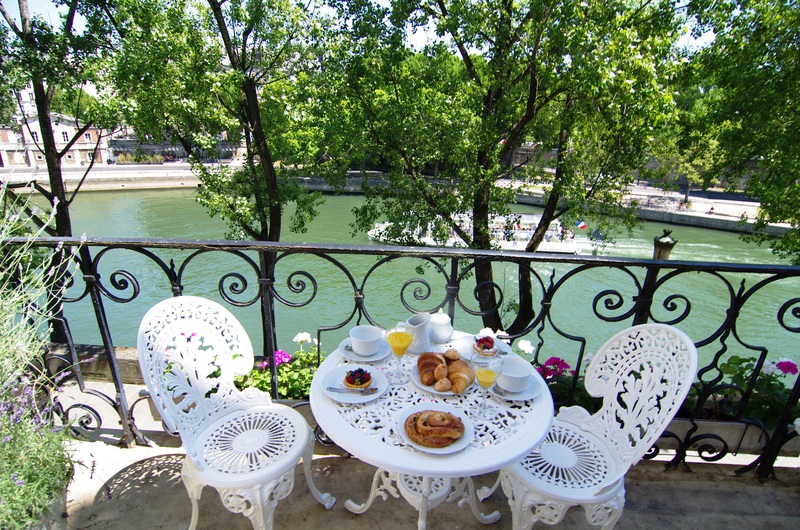 Pack your swimsuit & sunglasses and laze in the sun by the banks of the River Seine, just a few minutes walk from your Parisian pied a Terre on Ile Saint Louis. Between the Tuileries and Pont de Sully, there are sandy beaches, palm trees, lines of deck chairs and water jets. Plus, you can join in the fun of a tai-chi class, rollerblading, scaling a climbing wall, or a relaxed game of boules. NEW in 2017 will be lots of international concerts in front of the Hotel de Ville and your rendez-vous at Paris Plage! The Seine unravels the secrets and story of Paris from its birthplace on the Ile de la Cite to the transformation of the quays at Bercy upstream, and the triumphant Eiffel Tower downstream. Our team will share with you their knowledge of the secret treasures of Paris, such as the location of hidden gardens and special nooks perfect for laying out your checked tablecloth and picnic basket laden with freshly baked baguettes, cheeses and wines from the nearby markets. Plus, the not to be missed Palais Royal Garden set amidst a breathtaking architectural ensemble. Shhhh! FOUNTAIN & GARDEN MUSICAL FIESTAS! August is a fabulous time to enjoy the fountain & garden fiestas throughout Paris, which feature dramatic water fountains spouting skywards and serenading listeners with music. Several circuits are available for you to explore including the stunning gardens designed by André Lenotre as the evening closes you can marvel at the spectacular fireworks exploding in front of the Grand Canal! 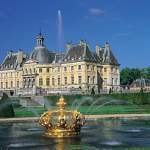 As a special favourite of our team are the gardens at Chateaux Vaux Le Vicomte not far from Paris. As night falls the garden come alive with an unforgettabl visual feast of thousands of flickering candles amid the majesty of this breathtaking estate. Les Bouquinistes, the riverside booksellers offer an enormous ‘open-air bookshop’ that is an integral part of the Paris landscape. 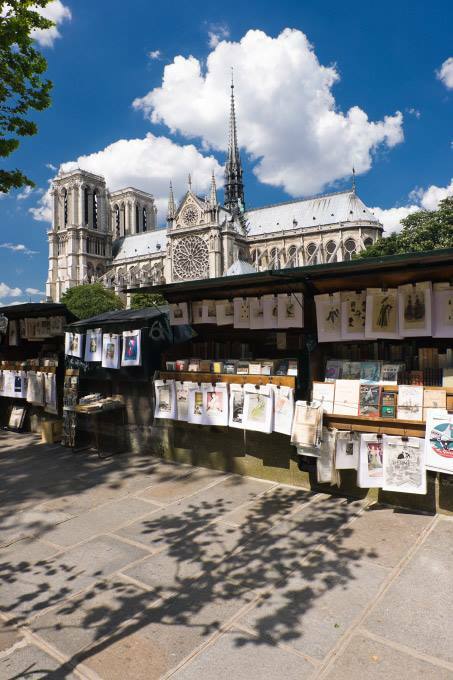 Located on the banks of the “Ile Saint-Louis” & “Ile de la Cite”, some 200 riverside booksellers open their green boxes to reveal a treasure trove for readers who visit them from around the world. Another essential pilgrimage for dedicated readers is a visit to ‘Shakespeare and Company’, an independent bookstore on Paris’s Left Bank. Since the 1920s it has been a gathering place for writers including Ezra Pound, Ernest Hemingway, James Joyce and Ford Maxox Ford. Australia’s best-selling novelist the late Bryce Courtenay also visited this bookshop in early 2012. You may also of seen this bookshop featured in the films ‘Before Sunset’, and Woody Allen’s ‘Midnight in Paris’. watch the world go by! 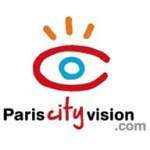 We also invite you to share with us your own discoveries from your sensational summer in Paris! We invite you to rediscover the magic of the Seine as you float by the legendary landmarks of the City of Light. We look forward to working with you to plan a special celebration from a wedding anniversary, birthday celebration, or a cruise for lovers on their first visit to Paris, the world’s most romantic city. We also highly recommend you step aboard ‘The Caliph” for an authentic cruising experience through the heart of Paris! you spectacular views. You will literally feel that Paris is at your feet! will ignite your passion for Paris! By going to our website you can enjoy a 360 degree virtual tour of each of our apartments ! The food markets of Paris offer an extravaganza of fresh produce that is at the core of French gastronomy. Our guests love visiting them and return home to their apartment laden with bags ready to ‘cook up a storm’. The famous flea markets are also not to be missed, and we promise that you will find something to take home with a story. Our Co-founders are also antique collectors and can offer you the benefit of their experience, if you are searching for something truly special. It is the perfect occasion to enjoy your next Summer 2014 to rediscover permanent exhibitions of the most beautiful and famous museums Paris: "Le Louvre, Pompidou, Musée d'Orsay… For all of this, there are No almost lines and little waiting. Such as it is the perfect time for privately guided tours of museums and visits Throughout city. Our dedicated and friendly team is standing by to make sure that your visit to Paris is perfect in every way. We delight in making sure that our guests feel like locals from the moment they arrive. We provide you with the latest insider tips on shows, markets, restaurants and speciality shopping! Explore Paris’s heritage in the capable hands of a professional guide who will speak to you of great historical moments and fascinating anecdotes, all in your own language. 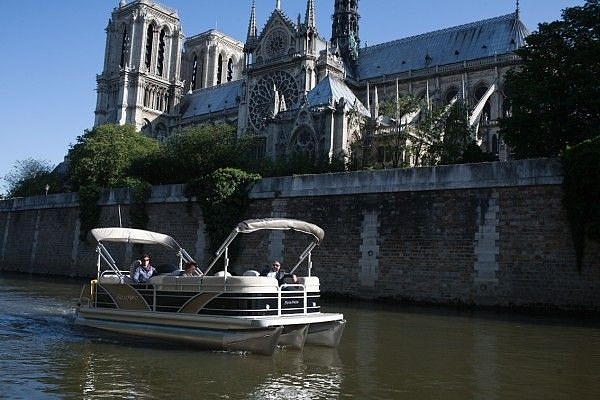 Get the best sightseeing tours of Paris and France in coach or minibus, Paris by night, Paris " à la carte ", or Paris is by minibus, Cityrama organizes sightseeing excursions and visits of Paris, dinner-cruises on the river Seine, weekends and tours in France. 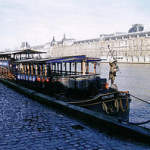 They offer a variety of boatsyou can rent to get a little ride on Seine,Marne & Canal St Martin and for any occasion: drink with friends, signing contracts, anniversaries etc. 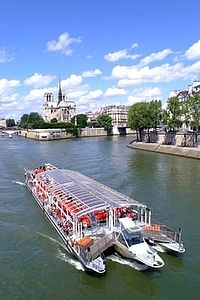 Sightseeing, Diner Cruises on the river Seine. Le Calife, an authentic cruising restaurant, welcomes you for a dinner cruise on the Seine through the heart of historical Paris in a warm and romantic setting. Candlelit dinners while visiting Paris… on board, on the Seine. Yachts de Paris can meet your needs for every reception and accommodates your budget for any occasion. Versailles Limousines is a service specialized in custom tour to Versailles, make you discover for a day or a week end the Versailles domain: the castle, the hall of mirrors, king’s bedchamber, Marie Antoinette, Apollo fountain. Castle of Vaux le Vicomte, inspiration of Versailles. D-1…… Everybody in swimsuit and sunglasses in….. PARIS! Voie George Pompidou & Bassin de La Villette. The Seine’s banks become pedestrian and the beaches are spread across three spots (Louvre/Pont de Sully, Port de la Gare and Bassin de la Villette). 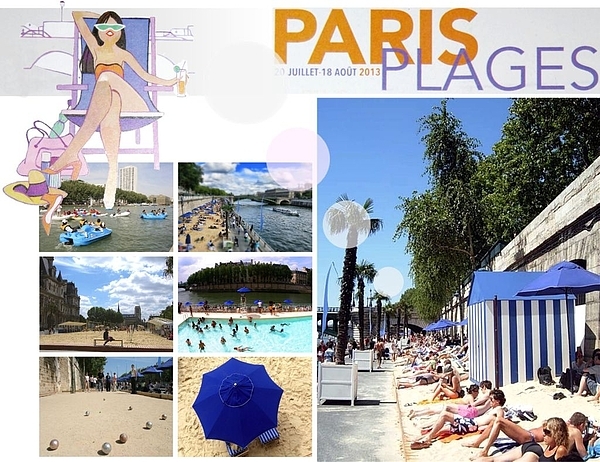 Paris Plage is set up: sandy beaches, deck-chairs, ubiquitous ice cream sellers, and concerts for French and foreign guests. Between the Tuileries and Pont de Sully, sand, palm trees and jets of water along the river. It features open-air attractions (rollerblading, tai-chi, wall climbing, boules etc.). Refreshment areas, play areas and deck-chairs are available for your time out unwinding by the river, ideal after a museum visit or a long walk from the Champs Elysées!! – NEW in 2013! A Tyrolean will connect the two banks! It will satisfy amateurs of thrill!! And to celebrate the opening…… A lot of concerts will stand in front of the Hôtel de Ville, from July 18thto the 21st ! Rendez-vous at Paris Plages from Saturday July 20st to Sunday July 18th, 9am to midnight!